The American city that comes to mind at the mention of Ayn Rand is probably not Chicago, a metropolis one might associate with other bestselling writers and authors, such as Studs Terkel, Carl Sandburg or even the current U.S. president, Barack Obama, whose philosophy is opposite of Rand’s integration of reason, individualism and egoism. One might think instead of New York City, where she lived for years while writing Atlas Shrugged, or Los Angeles, where she lived with her husband on a ranch in the San Fernando Valley and while writing her screenplay for the movie version of her novel The Fountainhead. But after Rand arrived in New York as a refugee from Soviet Russia in 1926, before she sold her first script in Hollywood and had Alan Greenspan at her Manhattan home for readings from Atlas Shrugged in progress, the literary heroine lived—and wrote—for a time on the south side of Chicago, where as an immigrant named Alice she apparently chose her new first name. She would return to Chicago after achieving worldwide success to deliver a blistering lecture to a sold-out audience at McCormick Place, where even a bomb threat didn’t stop her from making what would become an enduring and prophetic case against the welfare state for laissez-faire capitalism. Piecing together facts of her months in Chicago with help from English literature professor Shoshana Milgram, an Ayn Rand scholar and biographer who teaches at Virginia Tech and recently corresponded via electronic mail, what emerges is an early portrait of a passionate intellectual in her youth. Rand arrived in Chicago from the USSR by way of New York when the 21-year-old was known as Alice Rosenbaum, or Alisa Zinovievna Rosenbaum, according to Milgram, who lectured on Rand at the Smithsonian Institution and is scheduled to discuss Rand’s life in Chicago at the annual Objectivist Conference at the Westin Michigan Avenue Chicago on July 7. Chicago, by Milgram’s reckoning, was Ayn Rand’s gateway to America. Rand knew that writing what she wanted to write could get her killed under a dictatorship, Milgram contends, so coming to the U.S. was part of the plan. The family of her mother’s aunt Chava, the Portnoys, had traveled to America and settled in “the city that works”. When they wrote to ask how the Russian family was, Rand suggested to her mother that she should propose a visit. Her Chicago relatives said yes. One of the Portnoys’ children, Sarah, owned a movie theatre, which made it easier to obtain Communist Party permission to study film in America, as Vladimir Lenin had designated cinema as the most important art. Milgram wrote that Alice Rosenbaum landed in New York on February 19, 1926. Within days, she boarded a train bound for Chicago. By Milgram’s account, Ayn Rand, in the U.S. on a 6-month visa, probably shuttled back and forth among her relatives with stays at Sarah’s home in the Cooper-Carlton Hotel at 53rd and Hyde Park Boulevard—the first high-rise on Chicago’s south side, later renamed the Del Prado, which still stands—at her Stone relatives’ home at 3155 Wallace Street and next to her Goldberg relatives’ family-owned grocery store in the Albany Park area. Thanks to a movie diary that young Rand kept, it’s clear that she saw many movies at Sarah’s theater, known as the New Lyric in 1926 and located on West 47th Street near South Halsted. Rand kept a list of the movies she saw, where she saw them, and who the director and stars were, grading each movie, from “not even zero” to “5+”. During her time in Chicago, Ayn Rand—who would write scripts for Love Letters (1945) which won an Oscar for Jennifer Jones as Best Actress and You Came Along with Lizabeth Scott—saw 140 movies at the New Lyric and at the New Terminal and the Metro (both at Lawrence and Spaulding). She also saw motion pictures by Cecil B. DeMille, whom she would meet by chance on a Hollywood studio lot months later, and Ernst Lubitsch at Warner’s Orpheum downtown at the corner of State and Monroe. When she was able to renew her visa when it expired, Ayn Rand decided that it was time to go to Hollywood and she traveled again by train, carrying in her possession a letter of recommendation to a studio owned by DeMille. It’s in and near Hollywood that Ayn Rand wrote her first movies and novels, including Anthem and We The Living. She first returned to Chicago 21 years later, a month before she testified to the House committee investigating Communist infiltration of the motion picture industry. Rand arrived in the Windy City in the railroad engineer’s cabin of the Twentieth Century Limited in late 1947, a trip she used as research for Atlas Shrugged. She visited Chicago on other occasions, too, including a stay after she lectured on ethics at a symposium at the University of Wisconsin at Madison before heading home to New York. On her way to accept an honorary degree from Lewis and Clark College in Oregon, Rand returned to Chicago once again, meeting with her extended family and being interviewed for Irv Kupcinet’s long-running radio program, Kup’s Show in September, 1963. 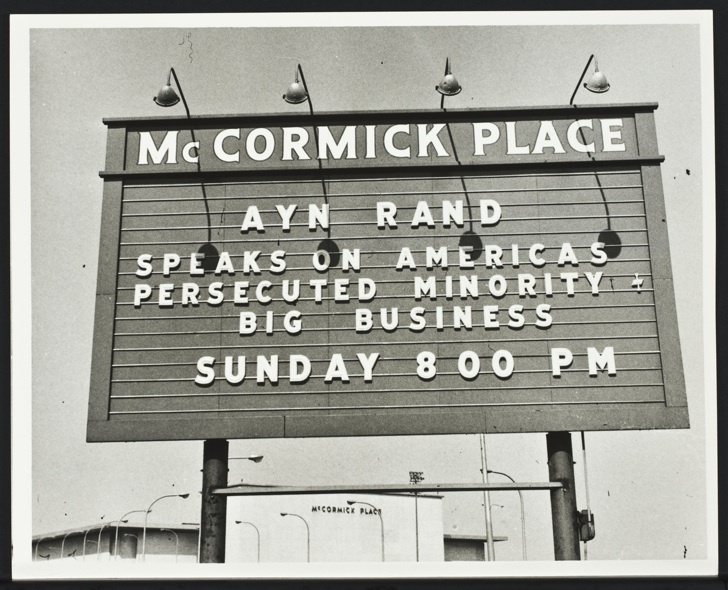 That’s when Ayn Rand spoke to an audience at McCormick Place. The title of her talk was “America’s Persecuted Minority: Big Business.” She had already delivered the lecture in Boston in 1961 and later at Columbia University—but, in Chicago, it was a huge hit. Nash, a New York-based marketing executive who had been director of marketing for La Salle Extension University in Chicago, remembers the day well, mostly because he was moved by Rand’s ideas, though he does recall that there was an anonymous phone call warning of physical violence. Nash said that people chartered buses from all over the United States. Today, Nash said he remembers Rand’s speech in Chicago as a highlight in what he called an attractive intellectual movement. I, too, was inspired by everything I got my hands on that she wrote, after I discovered her in 9/65. This completed my transition from a mystic-altruist-collectivist to a person of reason, egoism, individual rights and industrial capitalism. It also helped me guide my way through the injustice of the military draft and the Vietnam ‘War’. Although I wound up in S. Vietnam for 6 weeks, my strategy worked. I got out alive and in one piece. It is always a pleasure to hear from those who were part of this exciting philosophical movement when Ayn Rand was alive. Thanks for sharing part of your story.